Unexpected Potential can change a game and even allow you to splash for some powerful card in another color (like if you have a solid White/Green deck, draft this from the first or second set of packs, and then open a Dack Fayden in your third, you now have a way to cast it). This can definitely help you in a game. 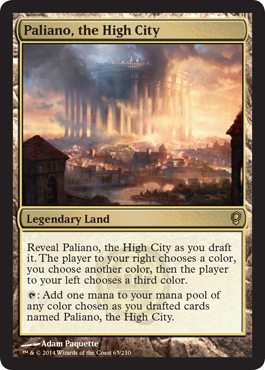 Paliano, the High City is a pretty cool card. 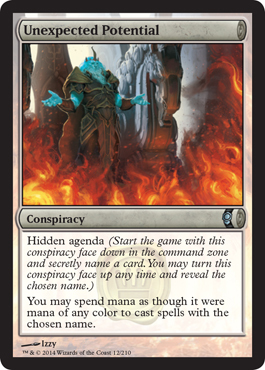 It can't be used outside of a Conspiracy Draft or a Cube, but it is a tri-colored land that comes in untapped, or even better, if you draft two, you could easily make this a 5 color land. Just like Unexpected Potential, you could easily splash for a particular card from your pulls. As always, be sure to check out our Spoiler Page for any other cards you may have missed.